So you really want to climb on top of that bar or branch, and it’s not as easy as it seems, right? First off, let me commend you on choosing real-life, tangibly practical physical fitness objectives rather than cosmetic, superficial rewards (not that you won’t get any by training to climb a bar, quite the opposite!). Maybe you think that it is all technique. Wrong. Maybe you think that it is all strength. Wrong. It is actually a matter of both strength and technique. However, you need develop the strength before you can hone the technique. Does that make sense? 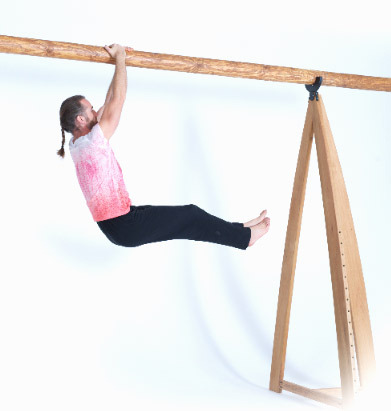 The most evident, simple way to develop the strength required will be to deconstruct the whole sequence (in this case a Deadhang to Sliding Swing-Up) into smaller movements that will help you gradually build up the specific strength you need by doing elements of the actual movement you need to do. To perform a Sliding Swing-Up, you need to be able to set your body up in a particular position, both armpits on the bar, and one leg hooked over it as well. If you start from a Deadhang stance and lack the strength to pull your whole body up in that position, that part of the sequence alone can be quite a challenge. The strengthening drills below will get you there, if you practice them consistently (there are faster ways to reach the Sliding Swing-Up position, but they demand even more strength). If you practice this movement consistently, grip strength, back strength, abdominal strength (and the many other muscles involved in this movement) will increase. The movement is also great for shoulder mobility and posture, too. Now, it’s time for some serious work. You’re about to learn a simple movement known as the Deadhang to Front Swing to Hand Foot Pinch Hang to Hand Knee Foot Pinch Hang. Got all that? Good. Let’s get started! If you’re just learning this for the first time, or if your grip strength isn’t great, choose a narrow, metal bar so it is solid and reliable. 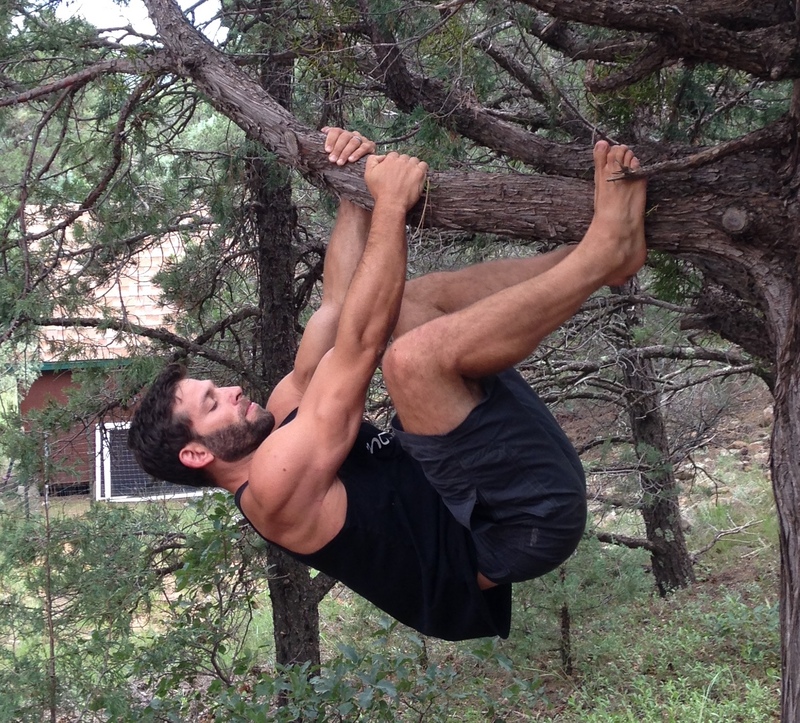 Step 1) Start in the Deadhang position, one hand in front of the other. You can also cross fingers, hands at the same level, or go for a split Deadhang, with the hands placed several inches apart. Choose the position that feels the strongest to you. Slightly bending your arms can help, especially if you have an open hand grip on a thick kind of surface. Note: If hanging is challenging to you and you are not 100% sure that you can rely on your grip, then don’t try the next movement (photo 2) and just keep practicing your Deadhang. Step 2) Lift both legs in front of you and drive your hips forward. If you lack grip strength or abdominal strength, make photo 1 and 2 your main drill before you start incorporating the next movements: just lift your legs, lower them to the Deadhang, and repeat. Step 3) If all is good with phase 1 and 2, practice the actual front swing, which involves letting the body swing backward, then forward again, and so on. When you’ve got momentum, all you need is to use the driving motion from your hips to maintain the pendulum motion. You can make this front swing a separate drill as well, before you add the next movement (photo 4). Step 4) When you have enough momentum, keep lifting your legs up and aim at your feet reaching the bar on each side of it, without pinching the bar yet. Make sure you don’t bang your feet hard on the bar, just slightly tap the wood, working on your accuracy. You can also train your abdominal strength by skipping the swing and transition directly from 1 to 4, without momentum. Step 5) Now practice the foot pinch. Squeeze the bar between your feet so it becomes a hold you can rely on and shift bodyweight to. 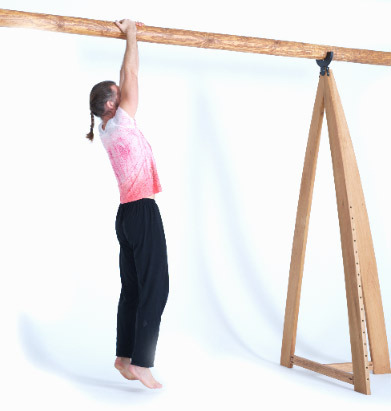 This is a Hand Foot Pinch Hang position that you can also hold longer as a strength drill. 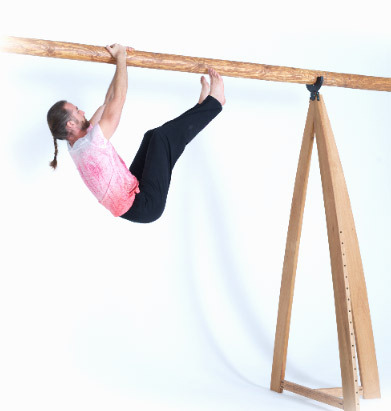 Step 6) From the Hand Foot Pinch Hang, you can pull on your feet, bend your knees, and squeeze the bar with the knees on each side of it, making it a Hand Knee Foot Pinch Hang. From there, you will be in a good position to hook one leg over the bar, then transition to the Sliding Swing-Up set up position. Yeah! The Deadhang to Hand Foot Pinch Hang, without momentum. You can also hold the hang a second, or much longer. The Deadhang to Hand Foot Pinch Hang to Hand Knee Foot Pinch Hang. You can hold the hang for a second, or much longer. The number of repetitions and sets you should do depends on the movement, and your current strength in relation to the movement. You can also go completely by feel. 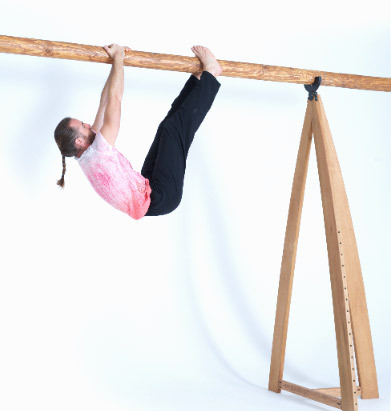 Once you can do it hanging from a narrow bar, you can add difficulty by doing the same drills on a thicker bar. The thicker the bar, the more grip strength you will develop. Simple enough? Now, it’s your turn! 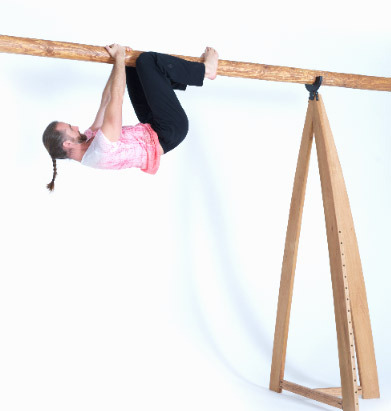 If you’d like some more help with these movements, check out this instructional video on the Hanging Foot Pinch from our From The Ground Up course. Safety note: Always check your surfaces. Don’t hold on to anything that could potentially break or collapse, and be aware if the surfaces are wet, slippery, or otherwise hazardous. If you’re alone, place a crash pad underneath, and/or find a spotter (someone ready to help quickly). The rule of thumb is to not try dynamic movements (especially raising your feet to the bar) if you are not 100% sure of your grip strength (because you lack it, or because you’re tired). Keep it safe, always.